The Garden with Insight project had its origin in June 1990, when one of us, Paul Fernhout, had an idea that a computer simulation might help people understand how to garden in a more sustainable way in their own backyards. He also saw that as a first step to simulating a space habitat. He started to work on the project part-time, and continued it on and off, while doing computer consulting and going to graduate school in Ecology. (Then he met the other one of us, Cynthia Kurtz, and we got married.) Cynthia, being also interested in gardening and ecology, started working on the project a year later. Together we put in over six person-years of work on the GWI project. PlantStudio took just nine months (because it reused a lot of GWI code) and StoryHarp about six months. to help people learn to garden with less environmental impact by helping them explore the long-term implications of their gardening decisions. 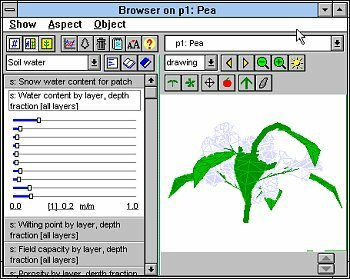 Garden with Insight was developed on both the Macintosh and Windows platforms, though the program ended up in Windows only. The project has included work in several development environments, including Smalltalk, Symantec C++, Borland C++, MetroWorks C++, Visual Basic, and finally Borland Delphi, in which the program is written now. (Paul wrote some translation programs to convert portions of source code from one language to another.) The name of the program went from "The Garden Game" to "Garden Simulator" to what it is now. We worked as a team on most design phases of the project. Paul did most of the low-level coding, the general architecture, the undo/redo system, the file system, the graphical display, and the 3D turtle engine. Cynthia did most of the translation of the EPIC model, the flowering/fruiting submodel, the plant drawing algorithm, the various window designs, and the artwork, music, and documentation. 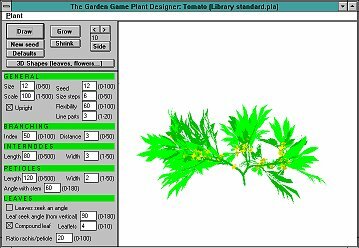 We started out wanting to make a garden simulation that was educational, entertaining, and easy to use, that covered all major aspects of gardening, and was accurate. We decided to work with EPIC (Erosion/Productivity Impact Calculator), an agricultural simulation created by the USDA Agricultural Research Service because 1) it was well respected and validated; 2) it covered some of the aspects we wanted to simulate; 3) it came with large data sets; and 4) it was publicly available. At first we tried to use the EPIC model as a reference, but we found that the documentation left large gaps that only the source code could explain, and the source code was so difficult to follow that to understand it we had to translate it. So one of us spent nearly a year translating nearly the entire EPIC model from FORTRAN to C++. In retrospect, translating the whole EPIC model was a wrong turn for two main reasons. EPIC emphasizes water and wind erosion very strongly, and devotes a lot of complex code to detailed simulations of water movement and runoff. But in a small garden, erosion is not important enough to merit all that attention. On the other hand, simulating home gardening does require a fairly complex plant growth model, to harvest individual cucumbers, for example; but the EPIC plant growth model is very simple and has major gaps (no flowering model, for example). So we spent a lot of time translating source code that we didn't need, and had to write a lot of code that EPIC didn't have. EPIC, like most agricultural models in FORTRAN, is extremely difficult to read and understand from a programmer's point of view. And the EPIC source code is about 17,000 lines of FORTRAN. In addition, our backgrounds were not in soil science, so we were learning as we went. The result is that even after translating EPIC and modifying it for the home garden, we still understand it only incompletely and feel that our adaptation of it is barely adequate. We also made some other mistakes along the way, including: 1) using Windows instead of the Macintosh (we knew the Mac better but went with Windows because of the larger market); 2) using Delphi instead of Smalltalk (which is better suited for creating simulations) because of licensing fees; 3) being too ambitious about what to include in our first version (we should have started smaller); 4) doing too little user testing; and 5) working in too much isolation. PlantStudio started life when we were working on GWI back in 1993. We started to draw some plants to use in the simulator at different stages of growth. Here is one of our early drawings of a corn plant, made by working from photographs. If we are ever able in the future to restart work on Garden with Insight, we would create two new products as follows. The first product would be a simple, appealing product that teaches organic gardening. This product would have a graphical interface somewhat like the garden window in the existing product, but would cover more of the gardening experience. Elements would include testing the soil, getting weather reports, trading with neighbors, getting advice from the library, selling produce in a market, dealing with insects and animals (both beneficial and pest), thinking about where food comes from and how it is produced, and seeing the long-term negative effects of pesticide use. The program's models would be very simple, probably combining rule-based systems and fuzzy logic with simple growth functions. We would use what we have learned in making the existing product to create these simplified models. The second product would be a simulation development system for gardening, agriculture, and other scientific areas. 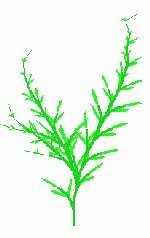 One of the most important things we have learned while making this simulation is that we have learned more about gardening than anyone can learn while using our program, because we learned by writing the program. The logical extension of the existing program is a modeling environment where the user starts by constructing simple models, then progresses to more complex simulations. The modeling environment would include facilities for graphing and statistical analysis, and a debugger and source code control system. Some time in 2007 we got the code for all three projects (GWI, PlantStudio, StoryHarp) about three quarters of the way ported from Delphi to Python but got stuck on the GUI part. Finishing the port would require rebuilding about 100 windows in Jython (Swing) or Tk or WxWidgets... which would take a while. If anybody is seriously interested in finishing the port for any or all of these applications, let us know. We would have released all of the code under the GPL (like the GWI code) but it's nearly impossible to recompile it under what-Delphi-has-become at this point.